The animal market at Katabon in Dhaka is probably the biggest of its kind in Bangladesh. 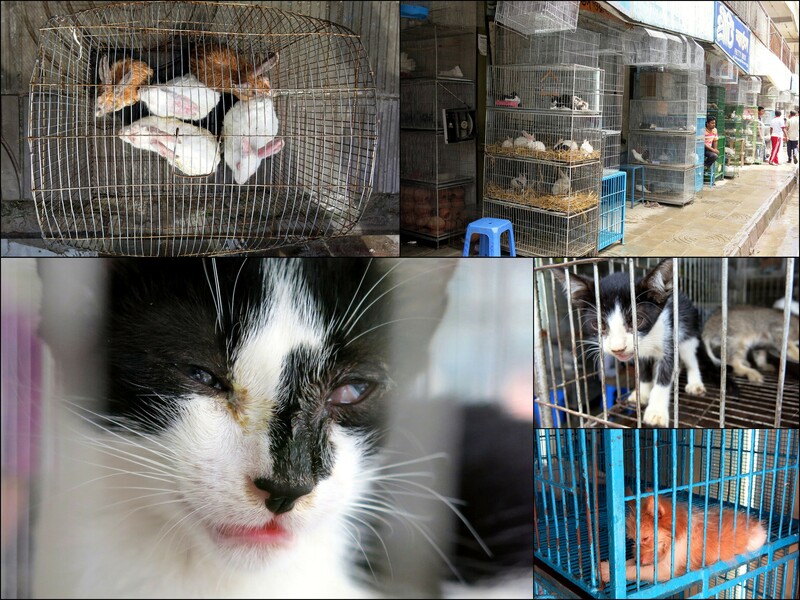 In more than sixty shops, businessmen offer mice, rats, guinea pigs, foreign and local dogs and cats, rabbits, turtles, and hundreds of species of birds and fish. By Gandhi’s measure, Katabon is surely failing the basic test of humanity. Cats, many injured and sick, are kept in small cages, often without water or food for many hours, exposed to the merciless Bangladesh sun. There are animals with nasty, untreated skin diseases, and dogs frantically walking in circles in cages with floors made of bare iron rods. Fish are being injected with colour dye and have their fins cut to appeal to consumers, and dozens of mice are cramped in cages the size of a sheet of paper. The horrific conditions in which animals are kept at the Katabon animal market are unacceptable, and we are confident that every reader who has ever been there will agree with our assessment. Remember that animals have a complex mental life and are capable of experiencing many of the same emotions we experience, such as pain, joy, sadness, fear, and anger. Next time you walk or drive by Katabon, look at the animals and imagine how you would feel if you were in their place. Bangladesh’s 1920 Cruelty to Animals Act makes keeping “any animal in such a manner […] as to subject the animal to unnecessary pain or suffering” a punishable offence, but, like all too many laws in this country, this law too is not enforced. The government has so far failed to afford the animals at Katabon the protection to which they are entitled. The University of Dhaka that owns the premises on which the Katabon animal shops are built does not seem to care much either, and one wonders whether this indifference is compatible with the spirit of a university where higher education is of paramount importance, and where we try to prepare students to be moral, just, and compassionate future leaders of our country. But not everybody turns a blind eye. Obhoyaronno, Bangladesh’s largest animal welfare organization, has been urging people for years not to buy animals at Katabon or elsewhere, and to adopt homeless animals instead. A few days ago, a petition was created, calling on the Government of Bangladesh and the University of Dhaka to shut down the Katabon animal market. Within less than 24 hours, more than 500 people have signed the petition which continues to spread like wildfire on social media. Bangladesh has a big heart and has always been sensitive to injustice. Katabon hence strikes a nerve. The great power we have over animals comes with great responsibility. It is the most vulnerable who deserve our protection most. Closing Katabon is not only our duty, but also a great chance. What does it say about us if we allow animals to be mistreated in broad daylight at the heart of the country’s capital? We can turn Katabon from a symbol of the vanishing humanity in us into a symbol of moral strength and the civilization we hope to build together. The Government of Bangladesh and the lovers of animals of all kinds in our society must speak up for the necessity of animal conservation, and of treating animals with respect, and be united in their stand on this issue. We must, in each of our houses, teach our sons and daughters the value of a healthy ecology, the roles the animals around us play in our ecosystem. We must teach them that our companion animals and other animals are not toys but a lot like us, deserving of love, empathy, respect, and adoration, regardless of species, breed, or origin. They need our attention and care. We need to make people understand that, if we fail to protect the silent beings amongst us, we will also become irresolute with regard to our responses to the suffering of humans, those who unlike animals always have a means to voice their discomfort. We must strive harder as a society to work towards building an empathetic public opinion about animal rights in general and showing how easy it is to make a positive difference, to chart a different path than the ignorance we now so easily engage in. The future of our nation’s reputation hinges a lot on how we deal with these kinds of issues. Our developing civilization cannot progress leaving our animals behind. Progress will be slow but in the end compassion will prevail, as it always has, provided we do not close our eyes to the truth that we witness at Katabon. We are beyond the point where contriteness is enough. We need to act. If we end the animal trade at Katabon and provide an alternative subsistence to the shop keepers, for example in the form of loans to enable them to start new businesses, we have achieved something that does more to display the good that a united Bangladesh can achieve than any of the record-breaking attempts that we feel so proud about. Are those 250,000 honorable nationalistic patriots willing to sing for the rights of our animals? Are we up for this challenge?